Caroline Bottom Anderson was born in St. Louis, Missouri in 1947. She grew up in Alton Illinois. 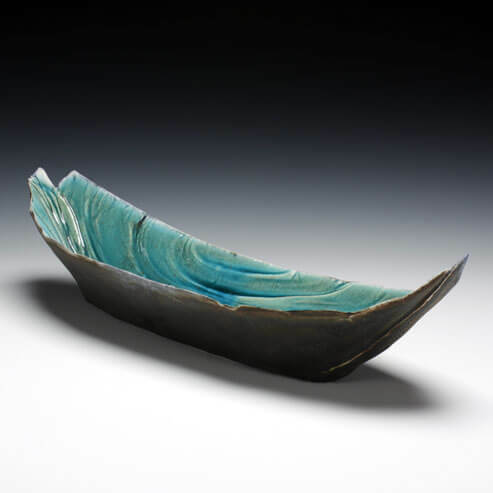 Caroline received her BFA degree in ceramics from the University of Tulsa in 1970 and subsequently earned an MFA in Art Studio from Southern Illinois University Edwardsville in 1976. Caroline built and has been operating her 1,000 square foot hot glass studio, Old Poag Road Clay & Glass in rural Edwardsville, Illinois since1990. She has received numerous awards including Best of Show awards in the 46th Annual Quad-States Juried Art Exhibition at the Quincy (IL) Art Center, the “Art on the Square” Art Fair in Belleville, Illinois and the St. Louis Art Fair in Clayton, Missouri. In 2001 she received an Illinois Art Council Artist Fellowship. She exhibits her work in several galleries across the United States and has work in several private & permanent collections. As a glass artist the past thirty years and a former ceramic artist (MFA in clay – 1976) I’ve always loved the transparency of glass and the potential for transparency in porcelain. While working in porcelain at the Red Lodge Clay Center, I will attempt to take advantage of this quality.